Kartikis the author of a widely read book on the new economics of technology, The ATOM, that has been featured in a Google Talk, multiple television programs, and numerous keynotes, including at the European Union in Brussels, Belgium. The two classes he teaches at Stanford University are devoted to the New Economics of Disruptive Technologies. 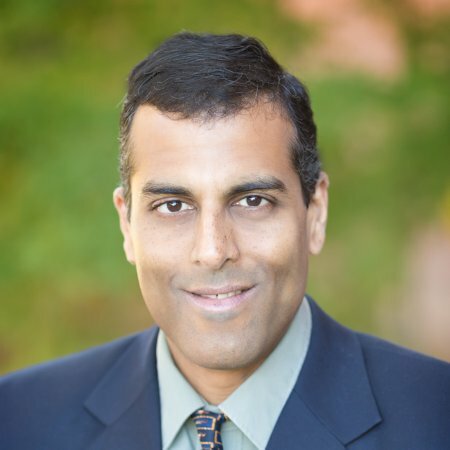 Kartik Gada has 20 years of experience across investment banking, hedge funds, and technology business unit management. He also teaches two of the most popular finance and technology classes at Stanford University. At Woodside Capital, his focus is on Artificial Intelligence, FinTech, and other advanced, high-impact technologies. He was previously a Managing Director at Reliance Capital. Before that, he founded 3D Strategies Management, a commodities futures hedge fund that was among the highest returning small funds during that period, with portfolio returns of 70%/year from 2009-13. Earlier, he was a Director at Netgear, responsible for the full P&L of the $250M consumer products division, launching 14 of Netgear’s 20 biggest products at the time. Kartik is the author of a widely read book on the new economics of technology, The ATOM, that has been featured in a Google Talk, multiple television programs, and numerous keynotes, including at the European Union in Brussels, Belgium. The two classes he teaches at Stanford University are devoted to the New Economics of Disruptive Technologies. Kartik has an MBA from the University of Michigan, Ann Arbor. He additionally studied engineering at Stanford University and Case Western Reserve University.